Caption slip reads: "My own time. Photographer: Sandusky. Date: 09-29. Assignment: Traffic, Sepulveda 2 mi. no. Sunset. D3-5, 8. 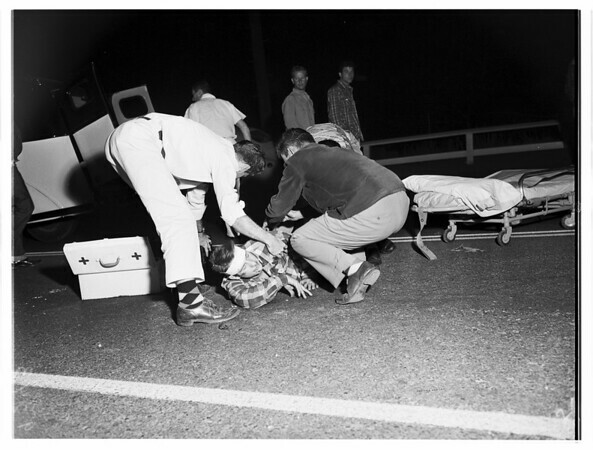 Victim is Arthur Langley. D6: Car, one victim on embankment partially visible is Ronald Monteverae. D7: Victim is Ronald Monteverae. D9, 10: Officer Al Metz".